Support your nitric oxide levels and connective tissue health with one product. How Resync Collagen Blend Is Beneficial for Your Health and Beauty? Add a scoop or (1) sachet of Resync Collagen to your tea to support your clean, deep energy. You’re going to have your tea anyway, so it’s super easy. Plus, you’ll notice a delicious change in the taste, but not texture of your tea. If you take it consistently, you’ll feel the results. You can also mix Resync Collagen just with hot water, and make your own from scratch Resync “tea”. You can mix Resync Collagen with cold/warm water, too! Simply enjoy this clean beauty juice for rest of your day. Do you like having a smoothie in the morning or pre/post workout? Regardless what part of the day, just add a scoop of Resync Collagen into your mix – and you’re set. It works, even if you’re already adding clean protein powder to your smoothie. The hydrolyzed collagen peptides from Resync Blend can add a lot of additional nutritious value to your smoothie. With a presence of approximately 30%, collagen is the most frequently found protein in the body and a very significant component of your connective tissue, playing a main role as a building block of your bones, cartilage, tendons, ligaments, fascia, and everything surrounding it. Collagen is stabilizing and it gives elasticity to your connective tissue. 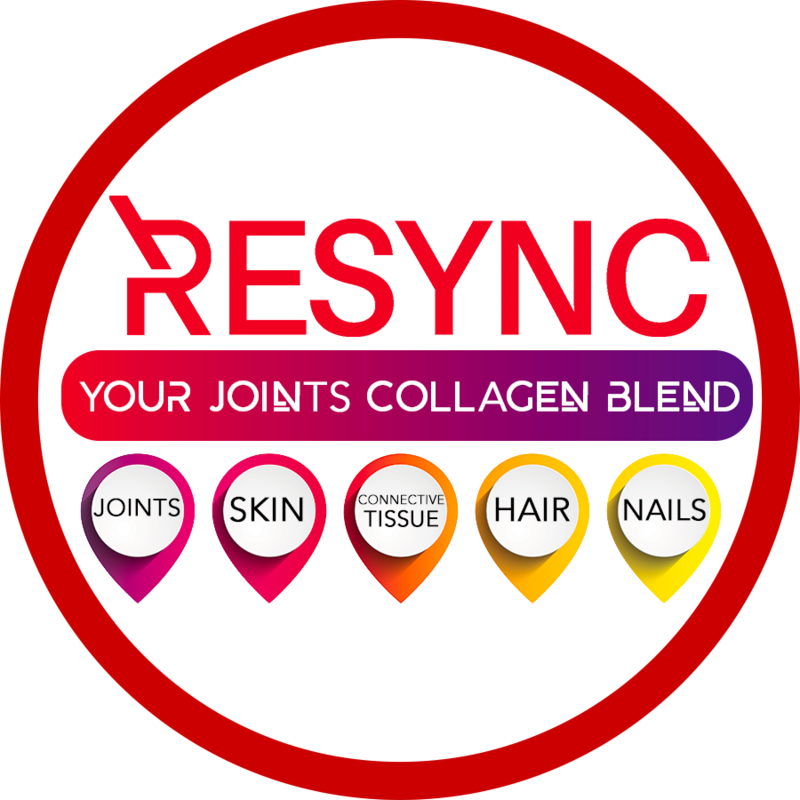 Here’s why you should pay special attention to Resync Collagen Blend. It was made not only to support your connective tissue health, but also to help you generate more energy. It contains nitric oxide precursors, the daily value of vitamin C, and antioxidants. * The above table was compiled with information from our competitor’s sites and/or their Amazon page on January 28, 2018. ** The % Daily Value (DV) tells you how much a nutrient in a serving of food contributes to a daily diet. 2,000 calories a day is used for general nutrition advice. Consume adequate amounts of carbohydrates, fats, and proteins daily–energy suppliers. Ensure important amino acids are available to you on a daily basis. Ingest sufficient vitamins B6, C, D, and calcium. Combat inflammation with omega-3 fatty acids –they contain anti-inflammatory micronutrients. Sign up for our email list to gain more data on how to eat to decrease inflammation in your body. Exercising regularly is important for healthy collagen formation, however, excessive training without sufficient regeneration is likely to lead to not only a reduction of collagen, but further damage to your connective tissue. When should you take Resync Collagen? Resync Collagen is best taken in the mornings or one hour before physical activity. You can also take it at night or post-activity to aid in regeneration of your connective tissue system. How should I take Resync Collagen? Resync Collagen is typically taken with 12-16 fl oz of water. You can mix it with hot, cold, or room temperature water. Keep in mind that it is more easily mixed with room temperature or hot water. If you mix it with cold water, please mix/shake well to avoid any clumping. You can easily add a scoop to a smoothie, baked good, or other recipe instead of just water! Click here to see our recipe book for some yummy (and healthy!) recipes. Can I take Resync Collagen on top of Resync’s Recovery Blend? Absolutely! In fact, for the best effect, we recommend taking Resync Collagen in the morning and Resync’s Recovery Blend in the evening. What does Resync collagen taste like vs typical non-flavored collagen? ypically, non-flavored collagen peptides have some mild flavor of their own, however, this is nothing like the taste of conventional protein powders and peptides. Because of their neutral taste and their great solubility, customers like to take collagen peptides in powder form without flavoring it. They end up mixing them into their drinks, sauces, soups, yogurt, oatmeal, and more. The options can be endless. Resync Your Joints Collagen Blend has pleasant passionfruit flavor, which adds natural sweetness without adding any sugar to your meals or drinks. It also adds likable natural fruity taste to already flavored (vanilla, chocolate) shakes/drinks. Can collagen peptides help support weight management? Collagen peptides, just like other proteins are essential for a balanced diet. They decrease appetite and lower the risk of food cravings, which in turn supports consistent blood sugar levels and helps to maintain concentration and performance for a longer period of time. In combination with strength training, they also support muscle mass, which in turn burns significantly more calories than fat.